Many skilled homeowners can take on the garage door insulation DIY job themselves. 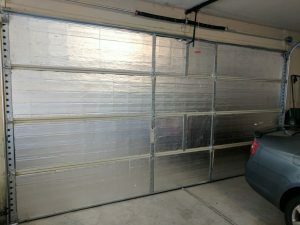 There are some important points to keep in mind if you are interested in insulating your garage door. You are adding weight to your garage door when you add insulation. A heavier door requires adjustment of your springs, and your garage door opener. These components work to balance the weight of your garage door and ensures it opens and closes properly. Ensure you are adjusting these things properly based on the insulation weight you add to your door. When you add weight, you add tension to those parts. Setting them correctly is not only safe for your garage door, but will ensure you get the maximum life out of those parts. Adding insulation can also throw off the balance of your garage door, so make sure you re-balance it when the job is complete. DIY-ing your garage door insulation is a great money saver. If you feel confident doing that, but not all the adjustments after, you can always split the difference and have a tech come in once the insulation is installed to check that your springs and opener are set correctly, as well as re-balance the door for you. One of the main reasons people choose to insulate their garage door is to regulate the temperature in their garage. This is especially important when you have an attached garage, or if you want to use your garage for more than just parking your car, as a workout space or project space. Helping to keep the garage warm in winter and cooler in summer is the goal of insulation. Insulation is also great as a noise reducer as well. If you live on a busy road, or want to enjoy a peaceful space for whatever it is you do in your garage door, insulation is great to quiet everything from outside that might bother you! As the hot summer is upon us, give GR8 Garage Door Repair a call today to get a quote on insulating your garage door!